Cable Ties for managing all those dangling cables. Effectively bring order to the cabling on your audio/video equipment stack, computer desk or in the networking closet. These superior quality nylon ties are easy to use and reuse with their self-attaching, hook and loop design. Choose from a selection of four colors (bright red, black, blue, and yellow) which enable easy organization of cable runs. • The 6in length and 3/4in width provides approximately 1.125 inches in diameter to hold cables. Painlessly organize the cabling on your audio/video equipment stack, computer desk or in the networking closet. These hook and loop nylon ties are easy to use and reuse with their self-attaching design. Two sizes (8in and 12in) are available to handle any job. • Constructed from high-strength, nylon hook and loop to securely organize cables. Cable Ties make wiring and cable installations clean and well organized. 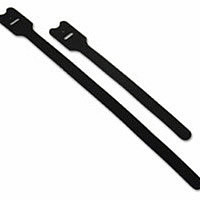 These cable tie mounts have a self adhesive pad on the back that makes tooless installation a breeze. Simple select the location for the cable mount, peel off the adhesive backing, press in place and thread the cable tie through the holes. 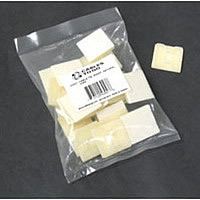 25 natural cable tie mounts per bag.